Another bobblehead pushed to the back of the shelf. 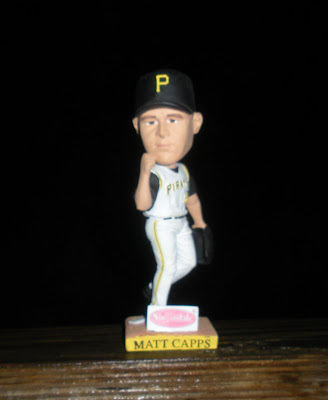 In news that sent shockwaves through the Pirates blogosphere, the Bucs did not offer a contract to Matt Capps yesterday making him a free agent. I guess we will have to find someone else to blow games for us. I wasn't the biggest Capps fan so this news is rather exciting to me. I mean seriously, the guy has one pitch, a fastball with no movement what-so-ever on it. GM Neil Huntington has a set of balls on him though because I think we can all agree that this can backfire on him. Relievers are so unpredictable year after year so Capps could return to his 2007-08 numbers and make Huntington like like a jackass. I'm with our GM on this one. It became obvious after this was announced that Capps had little or no trade value. Cut ties and move on. There was no need to offer him salary arbitration and overpay for a closer who might not even be the closer out of spring training. I'm in the minority on this so click on these links for other opinions. Keep the faith kids. 2011. Mark it down. Go Bucs!